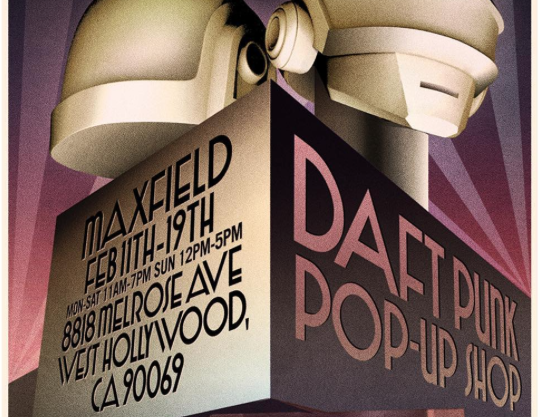 French electronic duo Daft Punk have announced that their new merch pop-up, launching later this week in LA, will feature pieces exclusively designed by the likes of Gosha Rubchinskiy. In addition to Rubchinskiy, you can expect work from Off-White, Enfants Riches Déprimés, sci-fi jeweller Han Cholo, Hervet Manufacturier and cyber-punk- influenced Darkdron, who have all designed clothes or accessories for the pop-up. But this will be no ordinary merch store — from 11 — 19 February, West Hollywood's 8818 Melrose Avenue will become something of a museum/fan paradise, featuring an array of tour memorabilia. According to the press release, visitors to the store will be able to view “a retrospective of archival set pieces, props, wardrobe, artwork, photography, and robot helmets on display for the first time”.